In a series of seven videos posted to YouTube in April of this year, we tag along with a coat-and-pants wearing unicorn as he pursues a woman he encounters at the start of his trip. It is unclear if he was planning to travel before meeting the mystery woman, but true love has inspired a lot less in the past. The app reads as a platonic mix of Tinder (without the swiping) and AOL Instant Messenger. 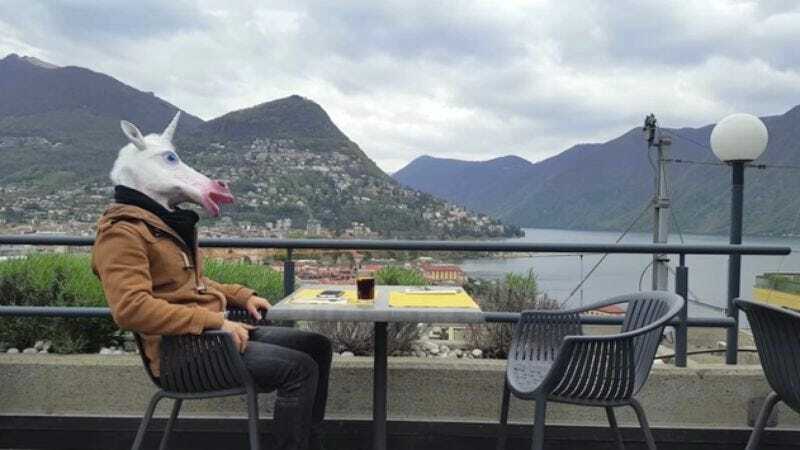 All promotion of the app focuses on the introduction of rider to rider, but the saga of this one lonely—and kind of untethered, to be honest—unicorn helps breed the possibility of a different kind of connection. The videos were uploaded in reverse order, so if you’re interested in as logical of a narrative as you can get, we recommend you start from video seven and work up. However, if you were really into the movie Memento, a reverse watch is just fine.